With enactment of THE RIGHTS OF PERSONS WITH DISABILITIES ACT, 2016′ from 19th April, 2017 and notification of THE RIGHTS OF PERSONS WITH DISABILITIES RULES, 2017′ on 15th June, 2017, the following instructions are issued in line with the provisions made therein regarding reservation for Persons with Benchmark Disabilities, as defined under Section 2(r) of the Act against the posts and services of the Central Government. A person who wants to avail the benefit of reservation will have to submit a certificate of disability issued by a Competent Authority. Such certificate in the event of selection of such person for any post, will be subject to such verification/re-verification as may be decided by the competent authority. 8.5 In the subsequent recruitment year the ‘backlog reserved vacancy’ shall be treated as reserved for the category of disability for which it was kept reserved in the initial year of recruitment. However, if a suitable person with that benchmark disability is not available, it may be filled by interchange among the categories of benchmark disabilities identified for reservation. In case no suitable person with benchmark disability is available for filling up the vacancy in the succeeding year also, the employer may fill up the vacancy by a person other than a person with benchmark disability. If the vacancy is filled by a person with benchmark disability of the category for which it was reserved or by a person of other category of benchmark disability by inter se exchange in the subsequent recruitment year, it will be treated to have been filled by reservation. But if the vacancy is filled by a person other than a person with benchmark disability in the subsequent recruitment year, reservation shall be carried forward for a further period upto two recruitment years whereafter the reservation shall lapse. In these two subsequent years, if situation so arises, the procedure for filling up the reserved vacancy shall be the same as followed in the first subsequent recruitment year. 9.1 Reservation for backward classes of citizens (SCs, STs and OBCs) is called vertical reservation and the reservation for categories such as persons with benchmark disabilities and ex-servicemen is called horizontal reservation. Horizontal reservation cuts across vertical reservation (in what is called interlocking reservation) and persons selected against the quota for persons with benchmark disabilities have to be placed in the appropriate category viz. SC/ST/OBC/Unreserved depending upon the category to which they belong in the roster meant for reservation of SCs/STs/OBCs. 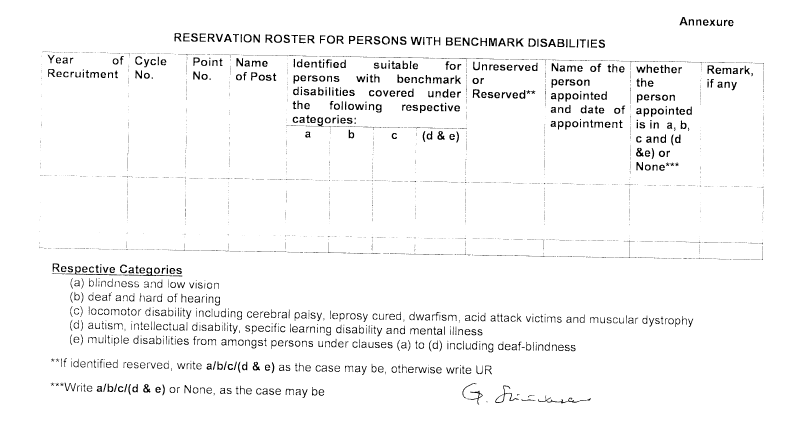 To illustrate, if in a given year there are two vacancies reserved for the persons with benchmark disabilities and out of two persons with benchmark disabilities appointed, one belongs to Scheduled Caste and the other belongs to Unreserved category, then the SC candidate with benchmark disability shall be adjusted against the SC point in the reservation roster and the Unreserved candidate with benchmark disability against unreserved point in the relevant reservation roster. In case none of the vacancies falls on point reserved for the SCs, the candidate under benchmark disability belonging to SC shall be adjusted in future against the next available vacancy reserved for SCs. The Ministries/Departments shall continue to upload data on representation of Persons with Benchmark Disabilities along with data on SCs, STs, OBCs in respect of posts/services under the Central Government on the URL i.e. www.rrcps.nic.in as on 1st January of every year. All Ministries / Departments have been provided respective usercode and password with guidelines for operating the URL. 14.1 Every Government establishment shall appoint a senior officer of the Department as the Grievance Redressal Officer. 15. All the Ministries/Departments are requested to bring the above instructions to the notice of all appointing authorities under their control. Important instructions are issued in line with the provisions made therein regarding reservation for Persons with Benchmark Disabilities, as defined under Section 2(r) of the Act against the posts and services of the Central Government.